At anchor in Back Creek. Click for more pictures. It actually feels kind of nice to be sunburned. After a winter in Rhode Island I’m finally starting to thaw out! Well, we made it to the Chesapeake. I must admit I wasn’t too impressed at first. Power boats rudely assaulting us with their wakes are pretty irritating when you’re trying to sail on otherwise flat water. Havre de Grace, MD, was not a particularly nice first anchorage. It was bouncy, noisy, and kind of ugly. At least we snuck some showers and picked up some provisions there. Our second spot, where we spent only an afternoon, was better. Actually, it was Betteron, MD. We swam off the beach there and enjoyed some more scenery. Our third anchorage was the best. 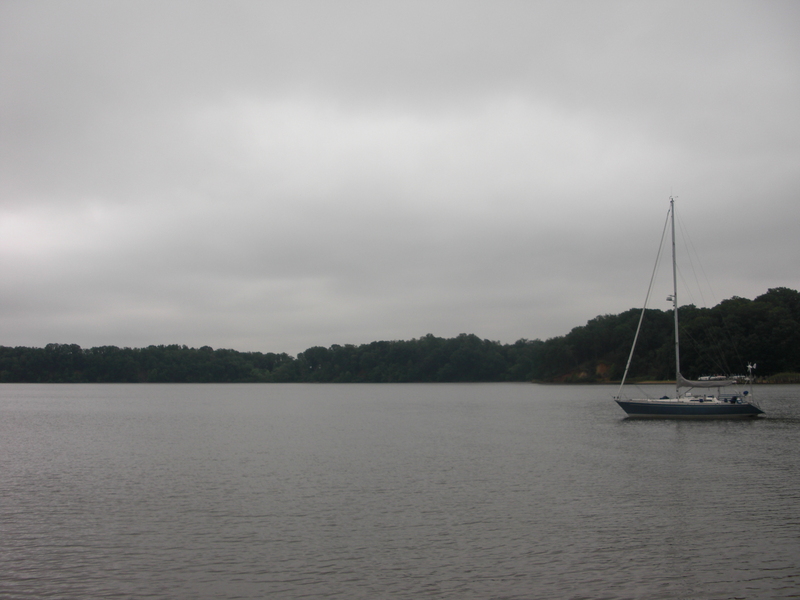 When Betterton got too windy and rough we motored up the Sassafras River to Back Creek and snuggled into our own private cove. We may have only had a couple of feet of water under our keel but it was paradise. The shoreline was covered with tall trees shielding grassy, green hills and a few isolated houses. Our cove featured the Mount Harmon Plantation, whose manor house offers tours Thursday-Sunday (we missed them). We did walk around the plantation trails yesterday. It was so gorgeous and green. Now I know what people mean when they say the air is thick and perfumed. That’s what it was like there. We swam in the relatively warm water (I scrubbed off the green stuff we’ve acquired on our water line since coming into fresh water), spent two nights at anchor, and had a bit of an adventure getting out this morning. We had set a stern anchor (a second anchor off the back of the boat) to keep from swinging into the shallower water. This morning we pulled it up to get ready to leave but then ate lunch before actually setting out. By the time we were ready to start the engine and take up the main anchor we realized we were stuck. It was low tide, the wind was blowing over the beam (middle of the boat) and we weren’t moving. Yuck. A quick glance at the tides showed high tide wouldn’t be till 7pm and there was still about half a foot to drop so we decided to try getting out as soon as possible. Pulling on the bow anchor and powering up the engine did nothing so we redeployed the stern anchor perpendicular to the boat out in deeper water. We used a monster primary winch to crank in on the stern anchor, gave the bow anchor slack, and before we knew it we were swinging free! Lee got the bow anchor up using the dinghy since we weren’t going back over there to get it in Pirat. Getting the stern anchor up was a bit more of a challenge. It was buried in an arms length of mud but we hauled it out with the winch. After only a little grounding on our way out of the channel we were on our way up the Sassafras again. Our current location: Georgetown Yacht Basin in Georgetown, MD. Lee needed to pick up a few parts for our leaky engine water pump so we came here for their marine store. Their pool and showers are nice too! It’s very hot and we both have sunburned backs. Some ducks came by earlier and I think they were flirting with the boat. Tomorrow we’re leaving the Sassafras and crossing the bay. Lee’s friend Jeff is coming up to sail with us for Memorial Day weekend and we’re picking him up in Baltimore on Thursday night.